Today it gives me pleasure to introduce my friend Alyssa ,the Everyday Maven where you’ll find everyday recipes made healthy and simple. Today, I am here to share a Vegan Red Bean Chili with Millet with you. Since it’s winter and so cold right now, there is nothing like a quick and healthy bowl of Chili to warm your bones for lunch or dinner. I make a lot of chili in my house and at any given time, have one or two variations in my freezer. 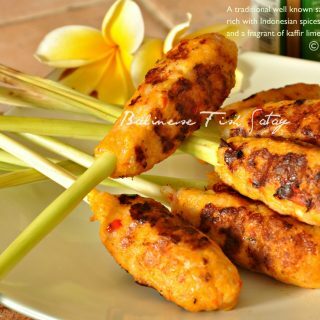 It is just an easy meal that everyone loves and is really versatile — high in protein and can be low in fats. You can top baked potatoes with it, serve it over rice or Quinoa, alongside a salad or cooked vegetables. Make tacos out of it, use it as a burrito filling or even top of scrambled eggs! Then there are the toppings – baked tortilla chips, stirring in polenta, roasted corn, cilantro, raw onions, Greek yogurt, shredded cheese, pickled jalapenos, guacamole and on and on. Another great thing about chili – as long as everyone likes the base, the toppings are up for customization so you can really please everyone! 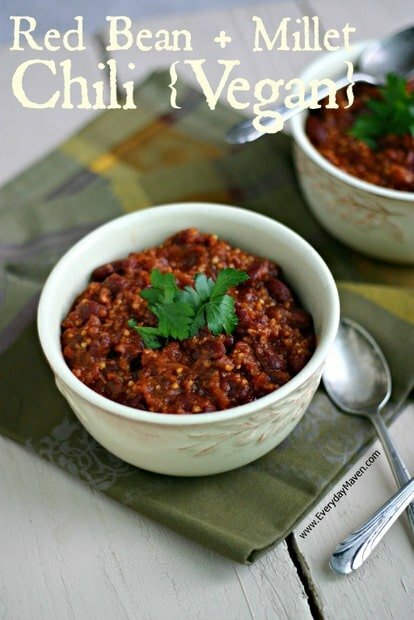 This Vegan Red Bean Chili with Millet might be short on beef, chicken or turkey but its not short on taste. I used a combination of Mexican and Ancho Chili Powders to give this a mild kick and finished it with some Millet for a bit of texture and extra heft. This freezes great and comes together with a minimal effort. A huge Thank You to Chef Dennis for hosting me here today and I hope to see some of you over at Everyday Maven! Chop garlic, onion, celery and jalapeno. 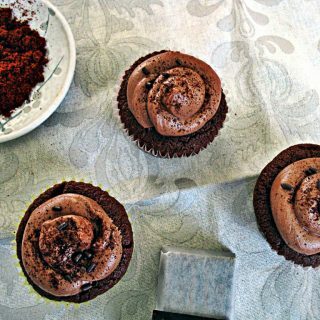 To save time, use your food processor (which is what I did!). Prepare onion, celery and jalapeno by quartering or chopping into large chunks. Add garlic, celery and jalapeno to bowl of food processor and process until chopped. Add in onion and pulse a couple of times. Measure millet and broth and set aside. 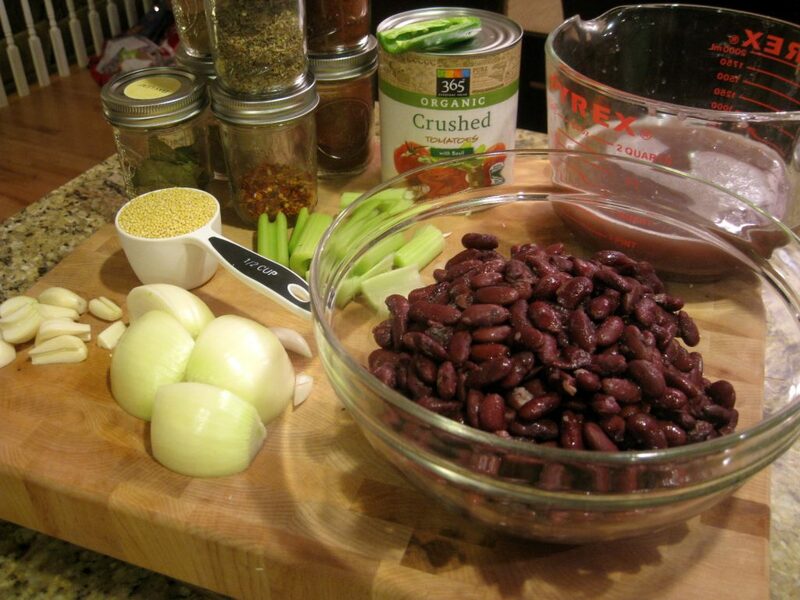 Open beans, rinse and drain or measure cooked beans and bean broth. Heat a large soup pot over medium high heat. Once hot, add oil. Add garlic and onion mixture and cook, stirring occasionally, for 4 to 5 minutes. Next, add in the spices and cook for 1 minute, stirring constantly. Add millet, beans, crushed tomatoes and broth. Stir to combine and bring to a boil. Once boiling, cover, lower light to a simmer and cook for 30 minutes. Remove lid, raise light to medium and continue to cook uncovered for an additional 15 minutes. 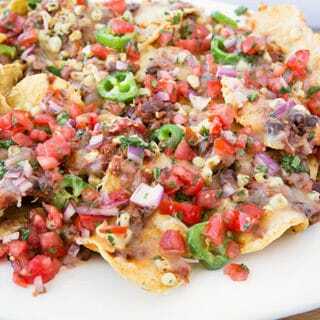 Excellent topped with cilantro or parsley and baked tortilla chips. Serve and Enjoy! Tried this recipe yesterday. Couldn’t find millet for some reason so I substituted orzo pasta. I am sure it’s not the same but it was a sub suggestion on another post. Chili came out quite nicely. I cannot say I am a true chili lover so I thought the seasonings were intense. I cooked the red beans from dry first and then proceeded with all other ingredients. I also couldn’t find ancho chili powder so I substituted with chiptole chili powder and that may also be the reason for the extra intensity. 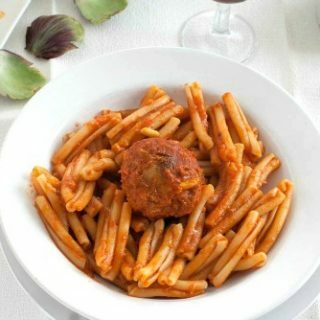 Definitely a hearty meal that needs no meat! Thanks for the recipe! This chili is amazing! I quadrupled it, and made it in my crockpot using dried beans instead of canned and no one could tell it was vegan. Yeah baby! I mistook chili powder for cayenne, at first, but caught it before it went in the pot. thanks for letting me know Melanie, I happy to hear you enjoyed it! When you used crockpot with dry beans did you presoak/cook the beans? Looking forward to another use for millet. I’ve had millet in my “bulk drawer” for a few weeks — thank you for giving me a great recipe to try it for the first time. We loved it! So excited to see one of Alyssa’s recipes featured here, Chef Dennis! This one looks perfect for these chilly days, and I love the use of millet! I love Alyssa, such a warm person! This chili looks packed with flavor and I love that it is vegan. Nice recipe Alyssa, and glad to meet you here! As some of the others shared, millet is a surprise. I’ll bet it makes the dish chewy-luscious. Warming spices, healthy, perfect for chilly weather. I can see making a big batch to enjoy for a few meals. Look forward to checking out Everyday Maven (and getting more involved with Google +). Great recipe. A properly made bean chili – and this one is properly made – really doesn’t need meat. The spices combined with the natural meatiness of the beans carries the day. I make a similar chili, and add sweet potatoes for extra flavor. Anyway, good stuff – thanks. Nice to meet you through Alyssa. The food blogging community is a vibrant and creative part of the blogging community and it is great that there are some folk like yourself to harness it a bit through Google+. I must admit to having signed up for when it started out but never used it. I must remedy that if it is as you describe. Sounds like a good move for all of us. And, of course, Alyssa’s recipe is fabulous and comforting. Millet isn’t just for bird feeders! Thanks Kellie, It’s very nice to meet you as well. If I can help you on G+ just let me know, I do have a few tutorials and you tube videos that many have found useful. Our community on G+ is growing everyday. What a lovely post, Alyssa! We adore chili and I recently discovered millet, so I’m excited to try your recipe. I’m happy to discover your terrific blog, too, Dennis! Hope you’re both enjoying a wonderful weekend. Have been a follower of Alyssa for a while. 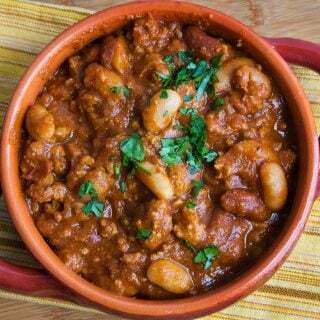 Chili is comfort food for cold damp weather which we are having today. Like the addition of millet. I’ve never tried millet, but this recipe makes me want to soon. Nice to meet you, Alyssa! Dennis, thanks for starting up Guest Post Fridays again and for all your efforts on G+! Looks like something I need to get on my menu! Thanks! I am such a chili lover. This look fantastic! Perfect for the winter months! Mmmm…this looks amazing! I always love Alyssa’s food and was so excited to see a new (to me) use for millet. I’m definitely going to be giving this a try. Hi Alyssa, nice to see you here! 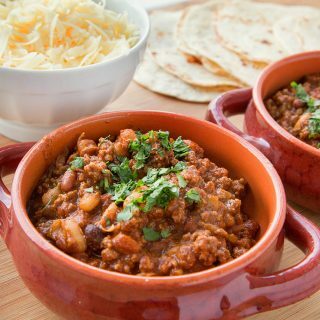 This chili looks so comforting and delish with the wonderful spice blend you used! mm i am always looking for food that is both vegan and hearty! (not that i’m vegan myself, but i enjoy vegan food). this looks excellent for winter! That is a great looking chili! I really like the idea of using millet in it.